A further strong growth in demand across all the main business segments lifted Broadcom’s (AVGO) fourth-quarter earnings and revenues. Shares of the chipmaker gained about 7% during the extended session Thursday after it published the better than expected results. Earnings, excluding one-off items, rose to $5.85 per share in the fourth quarter from $4.59 share a year earlier, exceeding market expectations. Unadjusted profit was $1.12 billion or $2.64 per share, lower than $0.56 billion or $1.25 per share in the year-ago quarter. Driving the bottom line growth, revenues moved up 12% annually to $5.44 billion in the three-month period, beating estimates. The Networking, Enterprise Storage, Wireless and Industrial Products segments witnessed robust demand. During the quarter, the management repurchased 6.4 million shares for about $1.53 billion and revised up the quarterly dividend for fiscal 2019 by 51% to $2.65 per share. “Looking forward to fiscal year 2019, we expect another year of double digit revenue growth. Sustained demand within our semiconductor segment will be augmented by the newly acquired mainframe and enterprise software businesses to our infrastructure software segment,” said CEO Hock Tan. 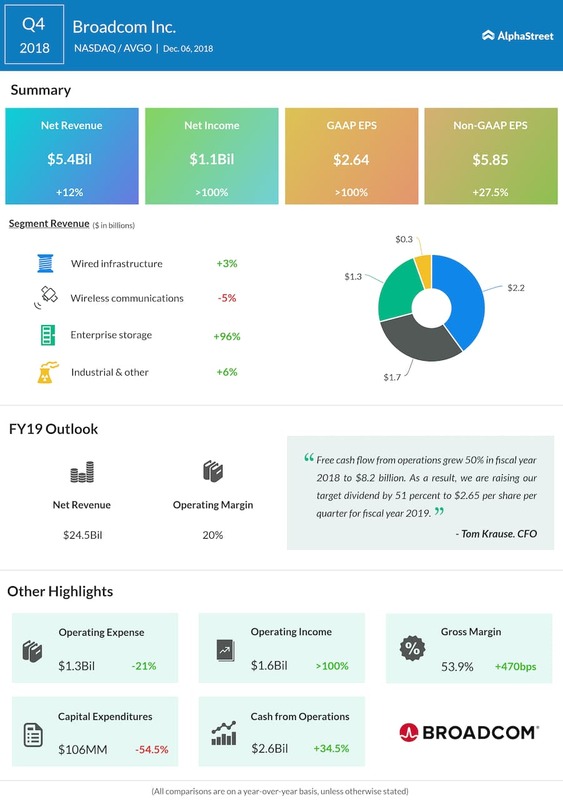 For fiscal 2019, the company forecasts net revenues of $24.5 billion, which is expected to generate operating margins of 20%. Excluding non-comparable items, operating margin is seen rising to a record high next year, helped by an improvement in operating leverage. Full-year net interest expense is estimated to be $1.25 billion. The technology sector is currently facing a great deal of uncertainty in the wake of re-escalation of the trade war between Washington and Beijing, especially after the arrest of Huawei CFO Meng Wanzhou earlier this week. The hostility intensified after the federal government started adopting aggressive measures to prevent the breach of intellectual property rights. Broadcom’s shares, which declined 14% over the past twelve months, witnessed a high level of volatility in recent weeks amidst the uncertainties triggered by the trade standoff. All along, they underperformed the market. After closing Thursday’s regular trading session sharply lower, the stock gained about 7% in the after-hours following the earnings report.